Two years have passed since the first internally displaced people (IDPs) appeared in Ukraine. Following Russia’s annexation of Crimea in March 2014, some residents of the peninsula fled to mainland Ukraine. These people feared repression from the new authorities, or simply did not want to remain among their fellow citizens who supported the “Russian spring”. A much greater influx of refugees began later that summer, when the military conflict began in the Donetsk and Luhansk regions of eastern Ukraine. Thousands of people had already left Crimea, but now hundreds of thousands of people needed help. Government figures from spring 2016 refer to nearly 1.8 million refugees, including roughly 20,000 people from Crimea. Government bodies were slow to react, and when they did, their efforts were disproportionate to the scale of the crisis. If wasn’t for the humanitarian relief organised by NGOs and volunteer groups, then Ukraine’s IDPs would have faced this situation by themselves. In fact, the only thing Ukraine’s bureaucracy managed was to infringe refugees’ basic rights — electoral and social. In turn, politicians who blamed the conflict entirely on residents of the Donbas played this response up. Ukrainian media frequently cast IDPs in a poor light, especially at the start of the conflict, whereas now they choose to avoid the topic entirely. As a result, Ukraine’s refugees have become something of an underclass. Deprived of their rights, they face bias and discrimination. At the very beginning of the conflict, those fleeing the east found shelter wherever they could — in derelict children’s camps, sanatoriums or dormitories. Food, medicine and other urgent supplies were usually provided by volunteers and NGOs, which relied on private donations or grants from international funds. A couple of steps away from Andriyivskiy descent in central Kyiv is the Humanitarian Aid Centre for refugees on Frolovskaya street — one of the best known aid centres in Kyiv. It’s located on the premises of a former textile factory, and people work from makeshift offices in old wagons and desks inside tents. There’s a warehouse for humanitarian aid, a playground, a computer class and much more besides. The whole operation is run by volunteers, many of whom are refugees themselves. Alena says that the centre has survived on donations alone the entire time — the state helped only with the wagons. She believes that Ukraine’s government have hardly reacted to this crisis, adding that laws that should have regulated the status of refugees and state support for them don’t work. “Refugees still need housing. Many are still living in temporary IDP camps, old sanatoriums and in conditions unsuitable for normal life,” continues Lebed. Sooner or later, most IDPs have to find housing on their own. The government has allocated a monthly payment of 440 hryvnia (16 euros) to each refugee, supposing that this would be enough for renting accommodation. Of course, that turned out to be insufficient. Moreover, for people of working age, this payment is restricted to a period up to six months. Pensioners also have the right to extend their allowance by another half a year. In Kyiv, the walk from the metro station to one of the dormitories where refugees now live takes 20 minutes. A loud motorway overpass, then a school, followed by a dirt road that turns to mud in the rain. This leads through abandoned building sites to a nine-storey building on Kustanaysky street. At first glance, it looks quite decent — neatly tiled walls and brightly-painted balconies. The front door is shut; to enter the building you have to talk to the caretaker through an intercom. Over the past year and a half, three dozen families — refugees from annexed Crimea and the war-torn Donbas — have been living in this very building. Until recently, they lived relatively peacefully. In December 2015 a notice appeared in the hallway: the residents were given a month to move out of the building, just in time for New Year. There was no signature under the announcement, simply the faceless words “the administration”. Apartment block on Kustanaysky street, Kyiv. (c) Vitalii Atanasov.Yaroslav shares a room of 20 square metres with his mother and older brother. They’ve been here since autumn 2014. “When everything started, I was studying in Kharkov in the faculty of law,” explains Yaroslav. 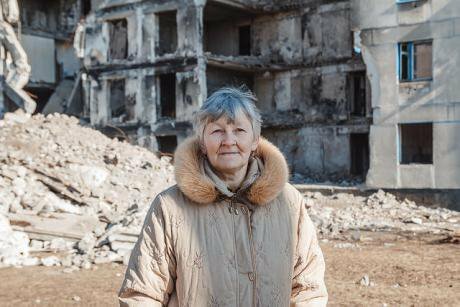 “I returned to Donetsk, to my relatives, and there’d already been shelling. Two weeks later, I moved to Kyiv. I thought I wouldn’t be here for long — firstly, I’d stay with relatives. They put up with me for three months and then asked me to clear out. That’s how we turned up here,” he says, glancing around the cramped room. As we talk, I learn that, according to a law passed in 2014, the Ukrainian authorities are supposed to guarantee free accommodation for IDPs for six months. As it happens, this has never actually worked out — even when appropriate accommodation has been found. The same thing also happened here: even though the dormitory belongs to a subdivision of the Ministry of Justice, the refugees were no better off. “The rent was only slightly below average. We were dealt with as though we were tourists, and even charged a tourist tax,” adds Yaroslav’s mother Tatyana. In order not to freeze to death, residents appealed to the state service for emergency situations, and the agency set up a heated tent outside their front door. “Those who couldn’t bear the cold could warm up there for a while,” says Yaroslav. In his words, attempts to evict the IDPs from the dormitory building continue to this day. In order to save their home, the residents have collectively bought their case to the Kyiv courts. They’re convinced that state officials have designs on the building — they want to privatise it. In post-Soviet Ukraine, social services have never been a priority. Over the past two years, the government has been working closely with the IMF, which demands that social spending be “optimised”. The policy has had visible results so far: in just two years, for instance, utility rates have trebled. The authorities want to save money on everybody, and Ukraine’s displaced people are no exception. This partially explains the state’s introduction of strict controls on IDPs, virtually identical to Soviet-era residency permits. IDPs are thus required to obtain a “resettler document”. Without it, they can’t receive their pension, nor social welfare; they can’t pay taxes, see a doctor or get a pharmacy prescription. 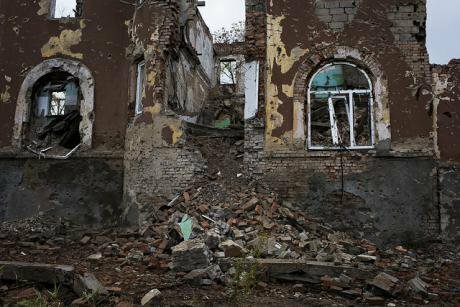 October 2015: destroyed hospital, Slovyansk. CC BY-ND 2.0 European Commission DG ECHO Follow / Flickr. Some rights reserved.But even people who do get these documents, with all the associated stamps, still can’t feel secure. In March, the government dramatically changed the rules: former prime minister Arseny Yatsenyuk declared that “crooks masquerading as refugees are receiving millions of hryvnia from the state budget”, and that welfare payments were to be suspended for some 150,000 people. Human rights defenders believe that the number of people affected may be several times higher. It turned out that the SBU, Ukraine’s security services, had drawn up “blacklists” of IDPs, which the Ministry of Social Policy then used to suspend payments, including pensions. The SBU has never explained how these lists were drawn up. In eastern Ukraine, the policy of blacklisting IDPs has hurt people on both sides of the frontline. The family of Aleksandr Slynko, living in the city of Kharkiv, has received neither disability benefits nor any other social welfare payments since March. “In March I was admitted to hospital in a critical condition, and shortly afterwards the payments stopped. After many inquiries, I discovered that the SBU had put us on the blacklist,” says Aleksandr. The Slynko family is in dire financial straits. “The volunteers have given us some money to cover utilities, and provided us with food. But April will soon be over, and our last money will run out with it. How can we go on living?” he screams down the telephone. To date, no government official Aleksandr has contacted has guaranteed that the payments will be restored. I meet volunteer Aleksandra Dvoretskaya at the House of Free People, a resource centre for IDPs, in Kyiv’s Podil district. Dvoretskaya is a refugee from Crimea. She left the peninsula in spring 2014 after sensing a real threat from the new authorities. Back during Maidan, someone had put up posters outside Dvoretskaya’s apartment block with her photograph, telephone number and home address. The anonymous authors asserted that Aleksandra was a “traitor of Crimea who supported the criminal Maidan”. After moving to the mainland, Dvoretskaya found a job coordinating Vostok-SOS, an organisation that helps refugees and people who have suffered as a result of the war. She calls these “blacklists” discriminatory and illegal. “For many people, social and pension payments are the only source of survival,” Aleksandra tells me. In the first instance, these payments are vital for those Ukrainian citizens who’ve continued living on occupied territory. These people cannot collect their payments until they officially register as displaced persons and get the necessary documents. Some people consider IDPs "traitors". СС: Yu. Gusev. / UNHCR / Flickr. Some rights reserved.“They’ve basically been forced to register as IDPs,” Dvoretskaya continues. Given that the banking system doesn’t work in unrecognised republics in the east, these people regularly risk their lives to cross the border, use the ATM and then travel back. Middlemen often do this for them — for a small percentage. Volunteers and displaced persons had hopes for Ukraine’s State Agency for the Reconstruction of the Donbas, established at the beginning of 2015. But the agency is yet to make any impact, and Ukraine’s new government is now creating a Ministry of Displaced Persons and Occupied Territories in its place. Given the successes of the old agency, few people believe the new ministry will change anything for the better. For instance, Dvoretskaya remembers the parliamentary hearings devoted to IDPs in February. “The volunteer and rights organisations that I work with saw these hearings as a victory. But in the end the ministers just ignored them, they didn’t even attend.” These were the first parliamentary hearings on the subject of internal displacement to be held in Ukraine, and around 350 NGOs were represented. Kliuzhev also sees the coming Minsk negotiations as a reason for a lack of interest. For Kliuzhev, if Ukraine’s displaced persons are allowed to integrate fully into local communities, then they’ll lose their ability to influence the political future of the occupied territories. Ukraine’s displaced persons don’t just face discrimination from state institutions. Stereotypes in Ukrainian society also play a role. For example, in many regions, displaced persons find it hard to rent apartments and encounter problems in finding work. First off, there were many more people in the “second wave”. Second, it was mostly activists and supporters of Maidan that came from Crimea. “At that time, people left the Donbas for very different reasons, the majority were fleeing the GRADs, bullets and bombs. They could have opposed Maidan, or, more likely, just want to be left alone,” Butkevich tells me. Long before the conflict in Donbas broke out, Ukrainian society had come to entertain a negative stereotype of people from Donetsk. Residents of Donetsk were people of “low culture”, bandits who respected brute force and who voted for the Party of Regions or the Communist Party. The ascent of natives of the Donbas into Ukraine’s high politics fostered this stereotype. In 2002, Viktor Yanukovych, who was governor of Donetsk region at the time, became the country’s prime minister, and many of his allies took leading positions in the government. During the 2004 Orange Revolution, when Yanukovych faced off the “pro-European” candidate Viktor Yushchenko, posters were stuck up around Kyiv with slogans mocking people from Donetsk (“Don’t piss in the lift, you’re not from Donetsk”; “Hey, you from Donetsk, don’t break the intercom”). Ukraine’s media aren’t coping with the displaced persons well: according to a monitoring audit carried out in autumn 2015, IDPs appear in one percent of reports on Ukraine’s central television channels. Mass media often exploit negative stereotypes and muffle the problem. And if they do raise issues connected to IDPs, then they accent the positive stories, which don’t reflect the real situation. In 2014, when IDPs were still a new phenomenon, the media paid more attention to them, but there was a lot of negative coverage — hostile language was used far too often. Journalists are now trying to talk more and more about the positive aspects of Ukraine’s “new life”. Traditionally, Bezverkhaia tells me, the press depicts socially vulnerable groups, including IDPs, as a “burden” for the majority or a “threat” to social order. It’s not surprising that society reacts to these images accordingly, with people justifying brute methods of solving these issues, or a refusing to engage with the idea that vulnerable groups need additional support. This is a vicious circle, and IDPs are the only social group directly interested in getting out of this dead-end. But they’re spread out over the country, their rights are being violated, and they have no political representation. And while this situation remains, the demarcation lines, real and imagined, will divide Ukrainian society.